It’s July here in Vermont, and that means it’s BBQ and potluck season. With so many pasta and potato salads out there, I like to mix it up and bring something less traditional to these events. 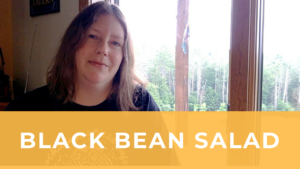 One of my go-to recipes has been this southwest-inspired black bean salad. It’s easy, economical, and accommodating for many different dietary needs. I hope you’ll try it, maybe add your own twist on it, and let us know how you like it! If the corn is tender and sweet enough you can use it raw, otherwise, sauté the corn in a little oil over medium heat for about 5 minutes, then remove from heat and allow to cool. Drain and lightly rinse the black beans, then drain again. 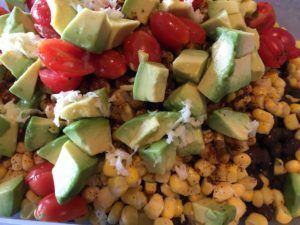 Dice the avocado and place in a large mixing bowl, then toss with the lime juice to thoroughly coat each piece. Add all of the other ingredients and toss again, then let sit for 1-2 hours in the refrigerator. Toss a third time and taste, then adjust spice and seasoning to taste.